November solicitations -- and much more!!! 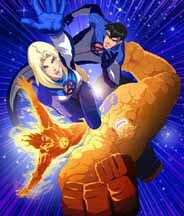 Two brothers and a couple of former Smallville guest-stars are among the main voice cast members for Cartoon Network's upcoming Fantastic Four animated series, The Continuum has learned. Brian Dobson is the voice of The Thing and brother Paul is providing the voices of both Doctor Doom and Mole Man in the series, which launches Saturday, Sept. 2. Both brothers have dozens of voice credits, including Transformers: Cybertron. Also recently, Brian was Lex Luthor in Krypto the Superdog and Paul was Juggernaut in X-Men: Evolution. Other main voices in Fantastic Four include Hiro Kanagawa as Mr. Fantastic, Lara Gilchrist as the Invisible Woman, Christopher Jacot as the Human Torch. Kanagawa is perhaps best known to comics fans as Principal Kwan from Smallville. He also played Taka in the recent "Sacrifice" episode of Spike TV's Blade: The Series and played Meizumi in the Elektra movie. Gilchrist played an 18th Century witch in the "Spell" episode of Smallville. 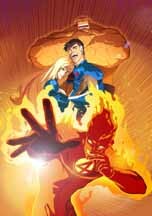 H.E.R.B.I.E., a character created to replace in the Human Torch in NBC's Fantastic Four animated series in the late 1970s, will be in the new series, voiced by Sam Vincent. Other voices in the show include Laura Drummond as Courtney Bonner-Davis, Sunita Prasad as Alicia Masters and Alvin Sanders as Phillip Masters (a.k.a. Puppetmaster). For a look at the first five episodes of Fantastic Four, CLICK HERE. And for a look at toys based off the series, CLICK HERE. For covers and five-page previews of DC Comics titles arriving in stores on August 30, CLICK HERE. Titles include JLA Classified #26, Teen Titans Go! #34, American Way #7, Man-Bat #5, Trials of Shazam! #2, Solo #12 and Uncle Sam and the Freedom Fighters #2. For covers and three- to nine-page previews of Marvel Comics titles arriving in stores on August 30, CLICK HERE. Titles include Mythos: Hulk, X-Factor #10, Ultimate Fantastic Four #33, X-Men: Fairy Tales #4, Black Panther #19, X-Men #190 and She-Hulk #11. The Detroit News' Comic Blog includes a new feature from The Comics Continuum. To read The Continuum's feature on Detroit's connection to Spike TV's Blade: The Series, CLICK HERE. * Rogue Pictures has bought the feature-film rights to Lost Squad, Chris Kirby's comic-book series that was published by Devil's Due as a mini-series. The property is set up with producers Adrian Askarieh and Daniel Alter. Devil's Due publisher Josh Blaylock will be a co-producer. Askarieh and Alter also have Hack/Slash set up with Rogue. * Marvel Comics has announced the Claws #1 has sold out. * Friday, August 18: Smallville Season 6, Teen Titans for September, Fantastic Four for September, James McAvoy attached to Wanted movie, First Looks, Civil War checklist and Highlander. * Thursday, August 17: Legion of Super Heroes' Shawn Harrison, Teen Titans: Trouble in Tokyo on Cartoon Network, Superman DVDs, Aspen Seasons, IDW's Angel: Masks, Moonstone Books for December, Top Cow First Looks and Archie First Looks. 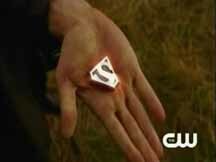 * Wednesday, August 16: Smallville: Season 6, Dwayne McDuffie at BET, DC First Looks, Image First Looks and Marvel First Looks. * Tuesday, August 15: X-Men: The Last Stand DVD, The Batman Season 2 DVD, Blade: The Series, Marvel First Looks and Civil War books delayed. * Monday, August 14: Dark Horse Comics for November, Teen Titans DVD, The Fountain and First Looks. * Sunday, August 13: Hellboy animated, Spider-Man action figures and Triumph Comics First Looks. * Saturday, August 12: Legion of Super Heroes, Spider-Man 3's Topher Grace, Family Guy, Smallville and Chuck Dixon writes for TightLip Entertainment. * Friday, August 11: The Simpsons, HBO/Cinemax in October, Image First Looks, Devil's Due First Looks, The Tick on DVD and July sales. * Thursday, August 10: Hellboy on Cartoon Network, Avengers movie, Image Comics First Looks, Dark Horse Comics First Looks, new Adult Swim series and Ultimate Fantastic Four press conference. * Wednesday, August 9: DC First Looks, Marvel First Looks, Archie First Looks, Teen Titans and Battlestar Galactica. * Tuesday, August 8: Legion of Super Heroes' Kari Wahlgren, DC First Looks, Marvel First Looks, Soulfire: Chaos Reign, Darkness/Wolverine, Teenage Mutant Ninja Turtles and SLG Publishing's Agnes Quill. * Monday, August 7: Marvel Studios, Legion of Super Heroes and The Runaways' Mike Norton. * Sunday, August 6: Wizard World Chicago -- Lynda Carter statue and WildStorm and Vertigo panels. * Saturday, August 5: Hellboy 2: The Golden Army, and from Wizard World Chicago: DC Universe, Civil War and Ultimate panels. * Friday, August 4: Top Cow, DC Nation and Mondo Marvel panels at Wizard World Chicago, X-Men: The Last Stand DVDs, Hellboy sequel and Archie Comics First Looks. * Thursday, August 3: Spider-Man 3's Thomas Haden Church, Virgin Comics for October, Arcana Studio's OutlawScorn 3030 A.D. and Blade: The Series. * Wednesday, August 2: DC Comics First Looks, Image Comics First Looks and Marvel Comics First Looks. * Tuesday, August 1: Doctor Strange animated movie, Spider-Man 3, Blade: The Series, Ultimate Spider-Man and Phoenix Warsong variants, Boom! Studios for October and Bongo Comics for October. * Monday, July 31: Warner Bros. announces The Dark Knight movie, Iron Man director Jon Favreau, Iron Man animated movie, Claypool Comics ceases print operations, The Batman, Icon's Criminal and Top Cow's Madame Mirage. * Sunday, July 30: David Lloyd's Kickback, Superman Returns and First Looks.